Are you a teacher or a parent inspired by Carol Dweck's growth mindset? In that case, you may be looking for a way to help children to develop their mindset. An interesting way to do this is by a simple tool called the Mindset Works Effective Effort Rubric. 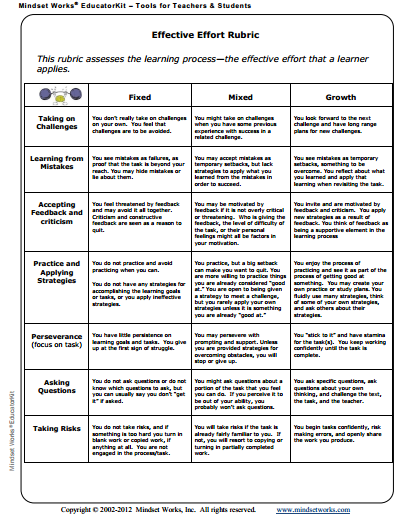 This is a table which, by use of 7 dimensions of mindset, shows the differences between a fixed mindset and a growth mindset. What you can do is to sit down with kids and look at the matrix and ask them how they are currently dealing with each of these dimensions. The dimensions are: (1) taking on challenges, (2) learning from mistakes, (3) accepting feedback and criticism, (4) practice and applying strategies, (5) perseverance (focus on task), (6) asking questions, and (7) taking risks. After you have gone through the dimensions you can ask kids what ideas for improvement they have and ask what steps they might take. You can find the Effective Effort Rubric here.